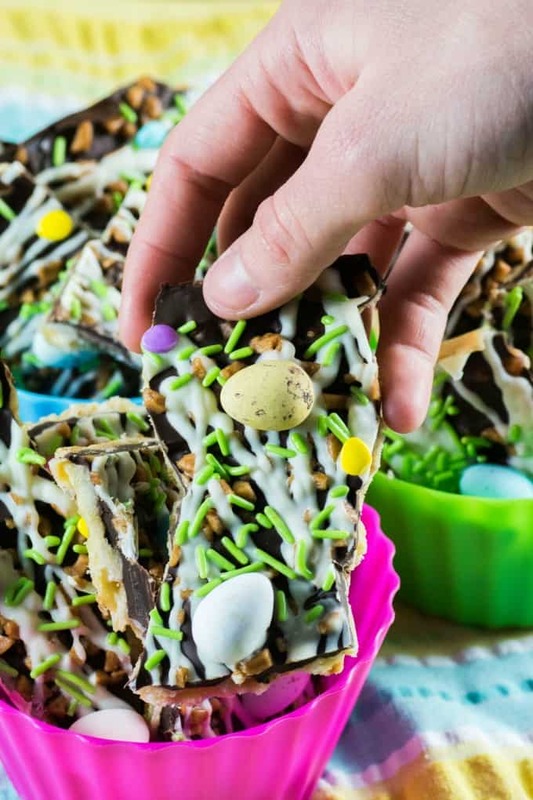 Easter Toffee Bark - The perfect candy for the spring season! Easter is just around the corner and Amber is happily making treats in the kitchen again. 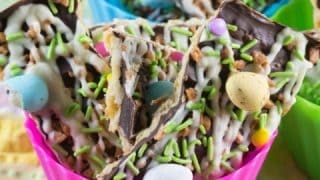 This time the recipe is Easter Toffee Bark and it is a sweet toffee bark that is decorated with pastel-colored Easter sprinkles and candy-coated chocolate Easter eggs for the perfect spring holiday treat. And it turned out not only so pretty but so delicious. 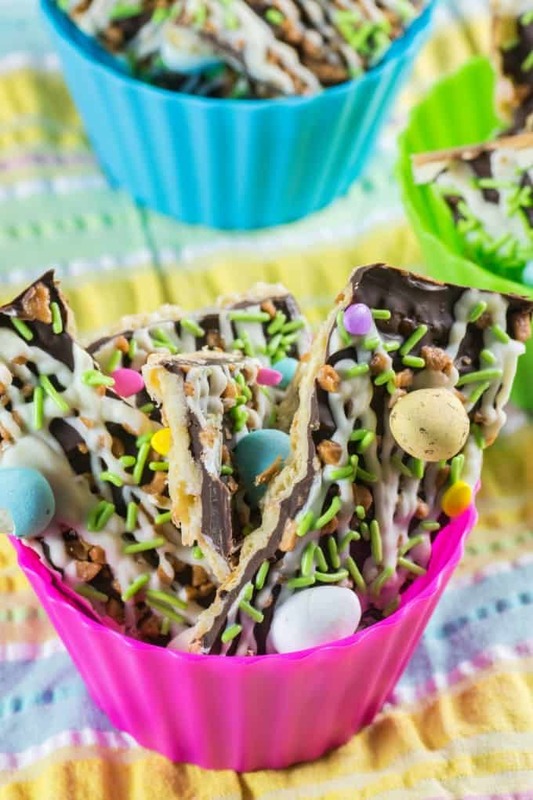 The perfect snack for the Easter Bunny to indulge in. Amber has already made super cute Easter Cupcakes and adorable Bunny Bum Cookies. We love Easter here right along with all the holidays. Bringing out the holiday ham along with great casseroles and sides makes for a happy time of year. Amber is in the kitchen a lot in spring and always does her famous deviled eggs also. 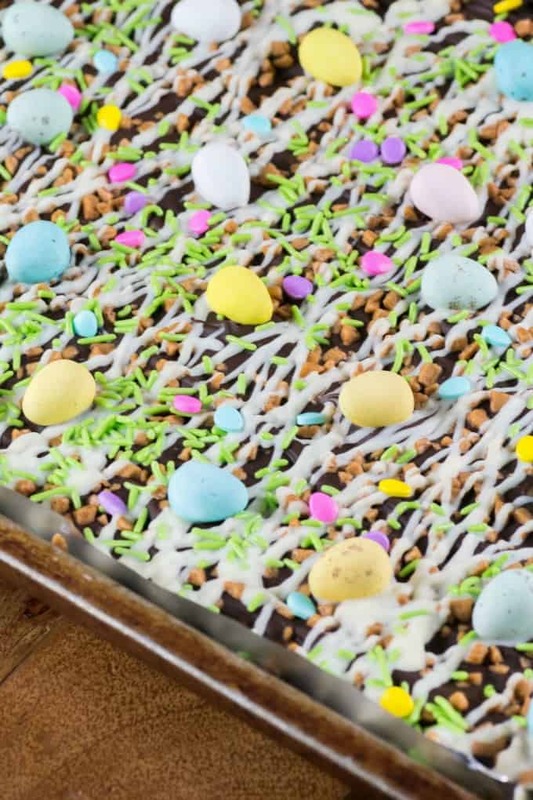 How to make chocolate toffee bark is super easy and look at how pretty this is!! You start with using a saltine cracker base, then a butter and sugar layer that is first melted in a pot, poured onto the saltines and then baked in the oven. That is the toffee layer, what could be simpler than that, right? No cooking to a hard crack stage and using a candy thermometer, nuh-uh, it is that easy!! Next is melted semi-sweet chocolate chips that just melt on the hot toffee layer, followed by toffee bits and a drizzle of white chocolate. Then the fun part with sprinkles, jimmies, eggs or whatever you like!! 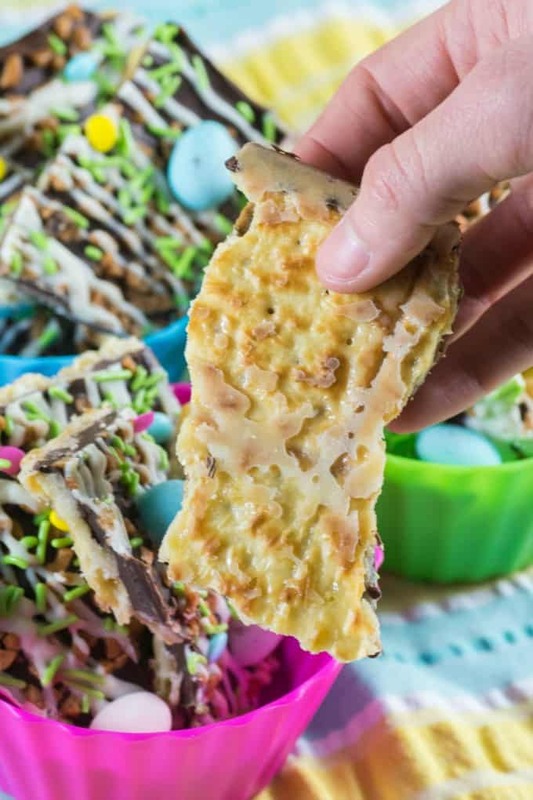 Use the salted crackers as you will want that sweet and salty flavor that marries so nicely with chocolate. You can make a large heavy cookie sheet of bark for all your little bunnies at this time of year. Line the cookie sheet with foil as it works better than parchment paper. You then can remove the bark from the tray easily. The bark, after being refrigerated for 1 hour, cracks easily into large pieces. You can then package them up into cello bags to give as treats or package the whole amount of bark into a sealed container and refrigerate until eaten. This candy treat doesn’t last very long in our house. It is like how fast our homemade Copycat Almond Roca lasts at Christmas time. Get it before it is gone!! 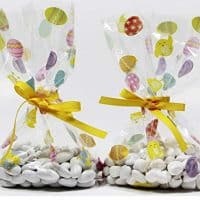 This is a great treat to put into Easter baskets or to serve at an Easter brunch or dinner as well. Put some out and watch it disappear. See the rich buttery toffee on the underside, yum!! This bark is simply irresistible. I have seen some recipes that use pretzels or graham crackers for a crust but I have not tried those. This is the best homemade toffee recipe around. One that you can make your own for any season. Enjoy!! 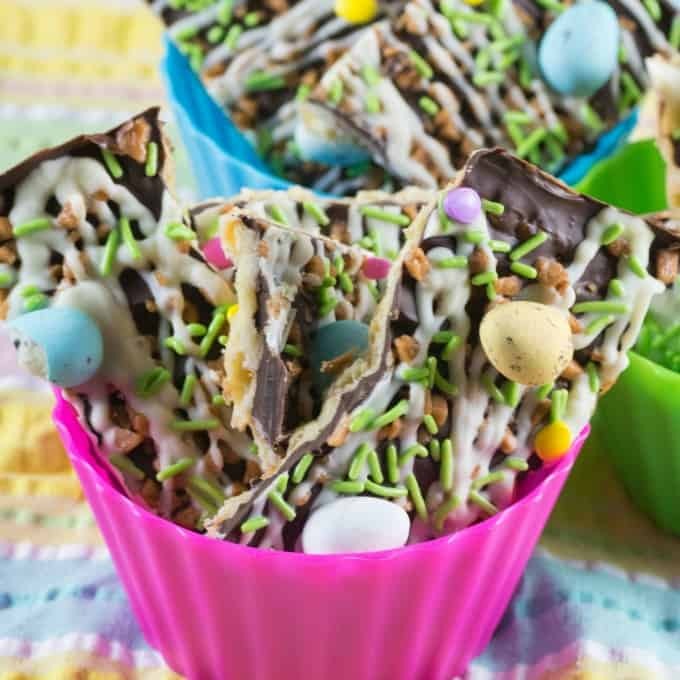 Sweet toffee bark is decorated with pastel-colored Easter sprinkles and candy-coated chocolate Easter eggs for the perfect spring holiday treat. 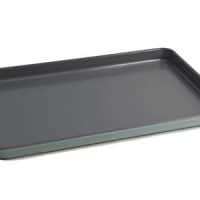 Line a 15x10x1" baking sheet with foil so that it covers it completely. You don't want the toffee to seep underneath. Add the saltines in a single layer. Breaking the last row to fit if necessary. In a large saucepan over medium heat add the butter and stir to melt. Stir in the sugar. Bring to a boil and stir for one minute until the sugar dissolves. Pour the sugar butter mixture over the saltines evenly. Bake for 8-10 minutes. Meanwhile melt the white chocolate in the microwave at 30 second intervals and have it ready in a piping bag. Remove from oven and sprinkle on the chocolate chips immediately. Allow chips to melt for a minute and then spread out evenly. Top with toffee bits and then drizzle with white chocolate. 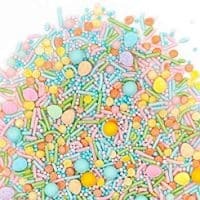 Finish off with Easter sprinkles and candy coated chocolate eggs. Refrigerate for one hour or until set. Break into pieces and store in an airtight container in the refrigerator. Such an amazing recipe! Can’t wait to make it for our Easter Brunch! Fun treats. This looks so fun and delicious. 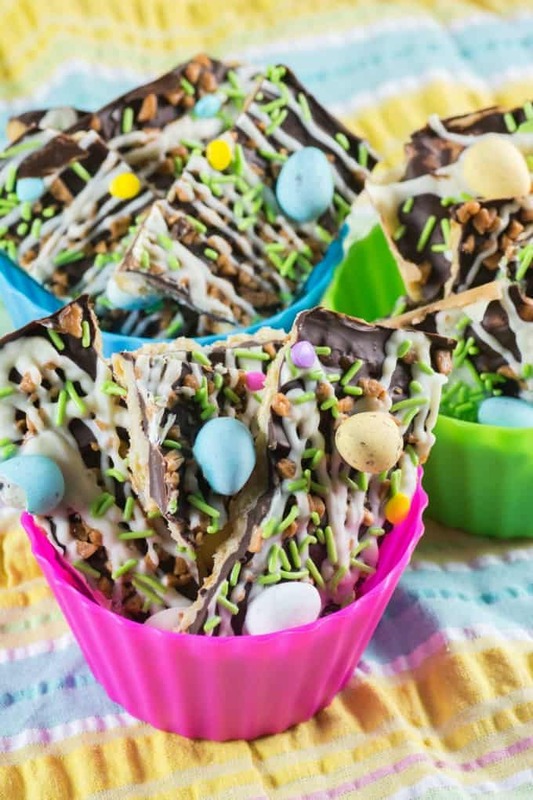 This is such a fun treat for Easter! Love it! That’s so pretty! I’ve made this bark before but use white chocolate instead. 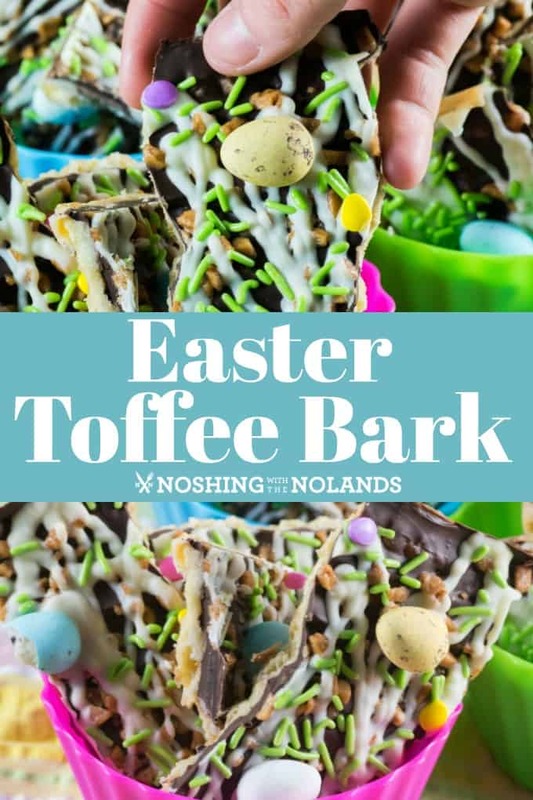 My girls just say the photos of this bark and now are begging to make it! They are obsessed with the colors and of course, the candy. This looks so fun to make. I bet my niece would love to make it with me. Yum!